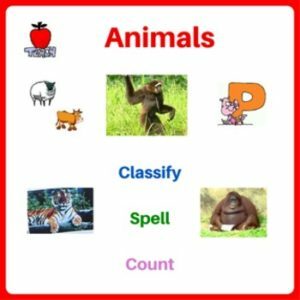 Learn animal classification, simple science facts, spelling and counting. Animals which are familiar to children, such as farm and zoo animals are found in the worksheets. Children do not learn in isolation. Extend their learning based on pre-acquired knowledge (animals they are familiar with) makes it easier for them to grasp new concept. -search for word: animals listed from a to z are hidden in word search. Answers are provided. 3. Practice counting below 50 by connecting dot-to-dot. 4. Color animals and copy sentences. If you like this product, please “like”, “pin” and “G+” it too! Click to sign up Teach Kid Learn Newsletter. You get to receive interesting and creative educational activities, learning resources, materials for teaching kids.